I recently rediscovered a photo (during a student's lesson - the table under the game is in the studio) that I took of an adaptation of "Hi Ho Cherry-O", and it has been fun to see it spread quickly across Pinterest! 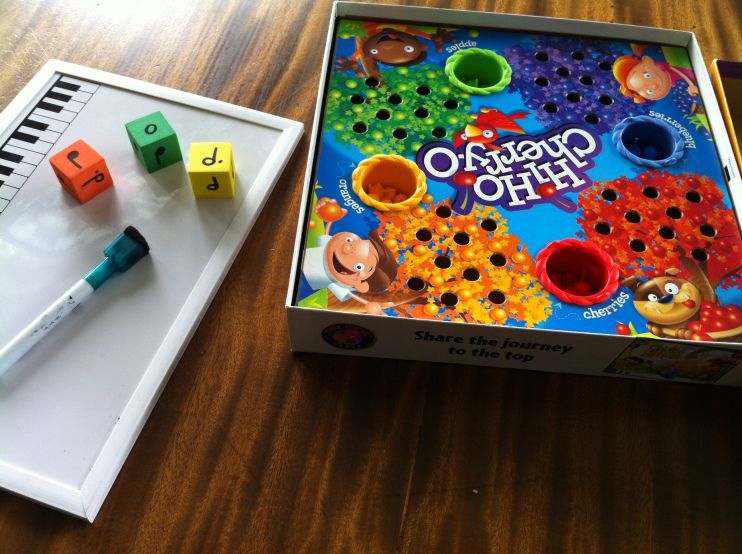 Hi Ho Cherry-O is a fun game for kids, available in most game & department stores, as well as Amazon (click that link) for $12.98 (with free shipping). My students enjoy the multi-color, multi-fruit option. Instead of the included spinner and puzzle, I purchased colorful cubes to label by hand. I drew 1x whole note, 1x dotted half note, 1x half note, and 3x quarter notes. A large container of them is currently available for $15.29 at Amazon. New, young students get to keep a block to use and adapt with any number of common, fun games at home. Because I play this with mostly young students, I decided to simplify the rules – accounting for only forward progress… and not use the original rules from the original version of the game, in which a player would have to return fruit to the tree. Often, students play this game before they have learned about rests or about the note names (adapt this as needed, based on the student's age & the amount of information you want to introduce each time). Generally, I start by teaching them all 4 basic notes (without the names) at the first lesson with just the counting values for a typical 4/4 time signature, without mentioning the time signature tidbit. Time to play = 3-15 minutes, depending on how detailed & silly you make it. Special Variation for older or more experienced students... use rests. The possibilities are endless. STEP 1: Choose Color Tree/Fruit & Block (one for each participant). Perhaps each use 2. STEP 2: Fill the tree with fruit, so you START with your fruit in the tree. Of course, you could do a silly version where you PUT the fruit in the tree according to the roll of the block. STEP 3: Take turns rolling your block. The more gusto, the better! STEP 4: When the block lands with a note value facing up, together CLAP and COUNT aloud the value of the note… quarter note (1), half note (1-2 = while holding hands closed), dotted half note (1-2-3 = while holding hands closed), whole note (1-2-3-4 = while holding hands closed). You’ll roll more quarter notes than the others, by simple statistics and probability, allowing for a slower game & more reinforcement of one of the most common note values. Perhaps even incorporate a metronome and music track into this activity. STEP 5: Student then draws that note on the double-sided white board (use a simple, inexpensive one). I like to use colorful, low-odor whiteboard markers. STEP 6: Introduce or review the NAME of the note if it isn't too much information. Be careful to gauge the student's interest & energy level and leave out this step for a lesson or two as needed. By putting names (something that can be rather tedious) into the routine of the game (something that is always fun), you’ll make the entire experience interesting (memorable AND fun). STEP 7: Student removes the correct number of fruit pieces from their tree(s) & puts them in a bucket (quarter note = 1 piece) (half note = 2 pieces) (dotted half note = 3 pieces) (whole note = 4 pieces). STEP 8: Win! ☺ Be the first to have NO fruit left in your tree. It is also VERY easy to adapt this concept to other games… Candyland, Chutes & Ladders, Monopoly, Life, and MANY more. I'd love to hear your stories. Contact me privately and with your permission, I'll add your comments to this post!